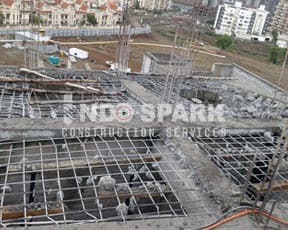 We at Indo Spark Constriction Services offer Concrete Breaking Services / Demolition Services of various structures, Using specialized machines and equipment. We carry out the Demolitions in proper Manner keeping in mind the inclination Angle, surface Area of the structure being demolished without Causing any damager loss to any property nearby. Rendering Services to commercial or residential structures, our Experts make safe use of the demolition equipment Such as electrical hammer machine, ensuring the Almost satisfaction to our client's. These services are rendered for various types of slab, beam, coloum, RCC Works, Brock works, walls, COBA and terrace waterproofing.